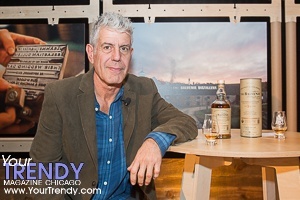 Anthony Bourdain was in Chicago to introduce The Balvenie Rare Craft Collection at The Balvenie Warehouse24 members-only event held at the Ravenswood Event Center. 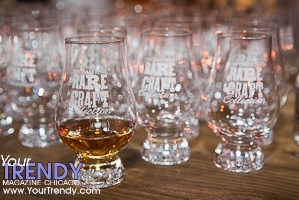 The Balvenie along with renowned culinary author and raconteur Anthony Bourdain, celebrated craftsmanship during the 3rd annual The Balvenie 2015 Rare Craft Collection in Chicago, part of a multi-city national tour. The Balvenie brand ambassador, Jonathan Wingo, kicked off the experience with a master tasting class for approximately 120 guests. Following this, Lorne Cousin, west coast ambassador for The Balvenie, led an intimate Q&A session with Mr. Bourdain featuring opening remarks by The Balvenie’s longtime malt master, David Stewart. 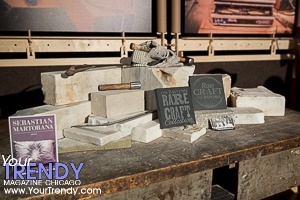 During the evening, guests strolled through the “workshops” of four impressive artisans who were hand-selected from a long list of talents across the U.S.A. by Mr. Bourdain. Also demonstrating his craft was Ian McDonald, head cooper for The Balvenie Distillery, who Mr. Bourdain first met earlier this year at The Balvenie distillery. Each artisans demonstrated his or her creative process and finished crafts, and discussed their personal stories with guests. All guests received samples of rare single barrel whiskies; straight from the cask and received special mementos of the event.